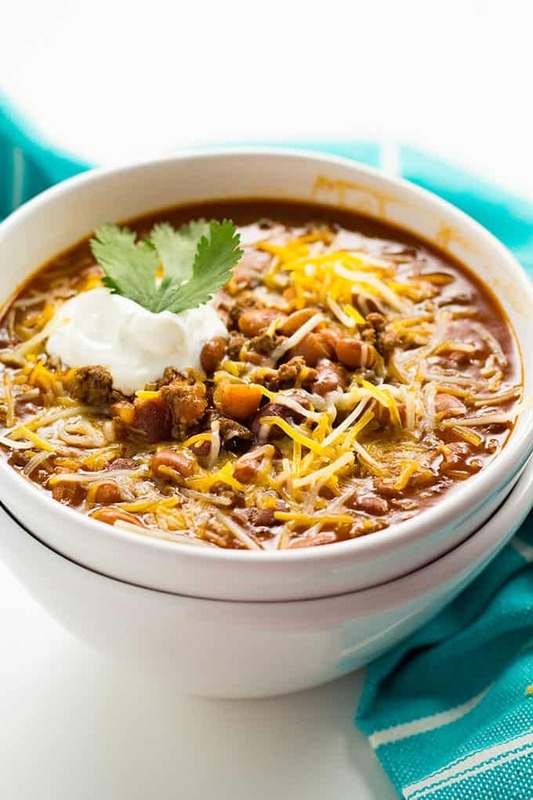 Best Easy Instant Pot Chili is simple to make with a mouthwatering combination of beef and beans! 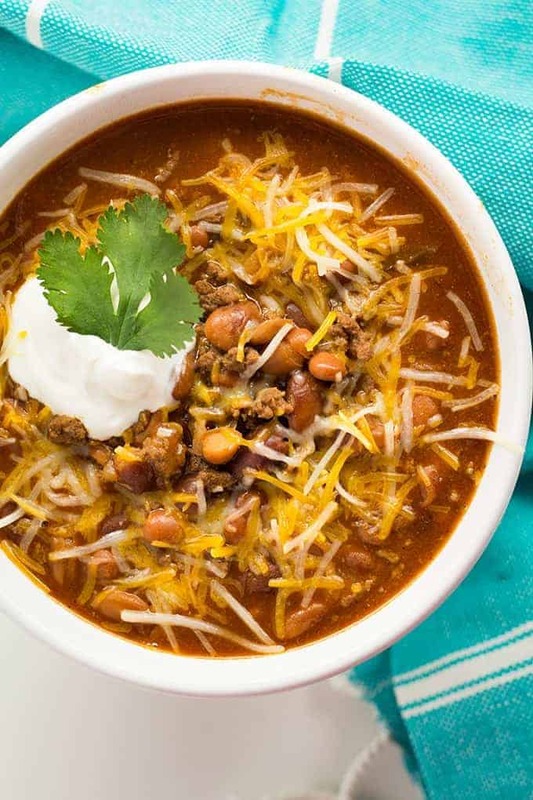 You can have a bowl of cozy chili that tastes like it simmered for hours ready in about 30 minutes! I have been wanting to try chili in my Instant Pot for months now! We are currently having a very cold start to spring, and there was no better time to give it a try. My instant pot chili is made virtually the same way that I make my chili in a traditional slow cooker. I have a very specific assortment of beans that I like to use for MAX flavor. 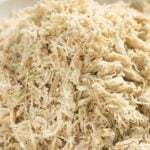 Typically, I don’t post pictures of a particular brand of ingredient unless the post is sponsored. 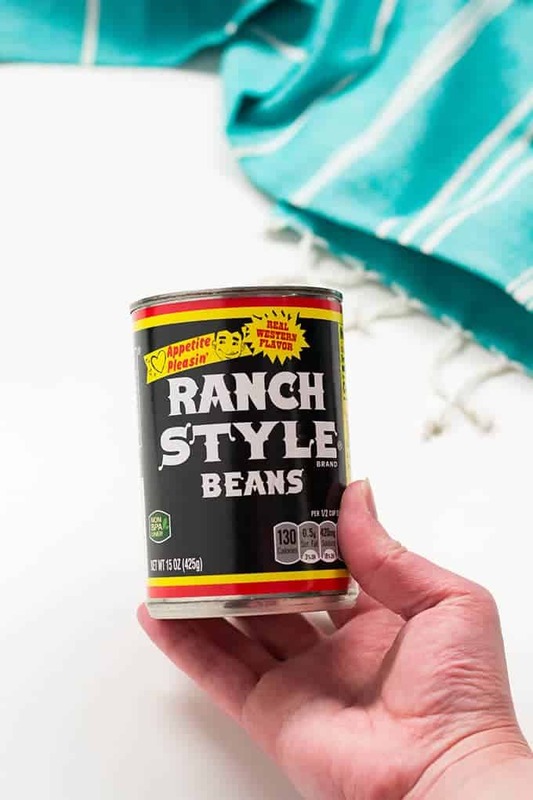 This post is NOT sponsored, however, the picture below is to show you what “Ranch Style Beans” are, just in case you aren’t familiar with them. I am able to find this style of beans at any grocery store I go to. They are just pinto beans, but I happen to adore the spices that they use. They pack some seriously amazing flavor that takes chili to another level. If you are unable to find them, you can simply use extra chili beans instead. I prefer this to plain kidney beans, again because chili beans are packed in a flavorful sauce and kidney beans are not. 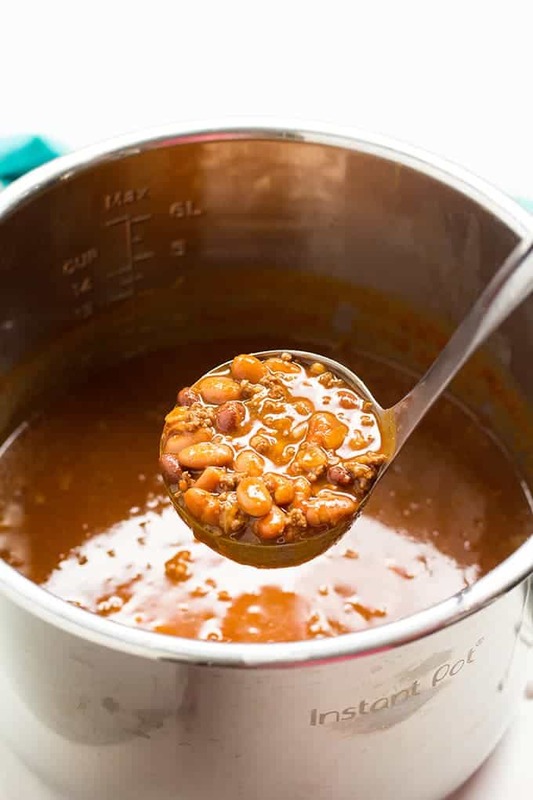 Chili is really easy to make in the Instant Pot. I tend to use VERY lean ground beef so that I don’t even have to drain any grease, and I can just keep on cooking. 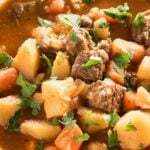 For this recipe, you will brown your beef using the saute feature in a small amount of olive oil along with some chopped onions and seasonings. When your beef is no longer pink use your best judgment and/or preference on whether you need to drain any grease from the pot or not. 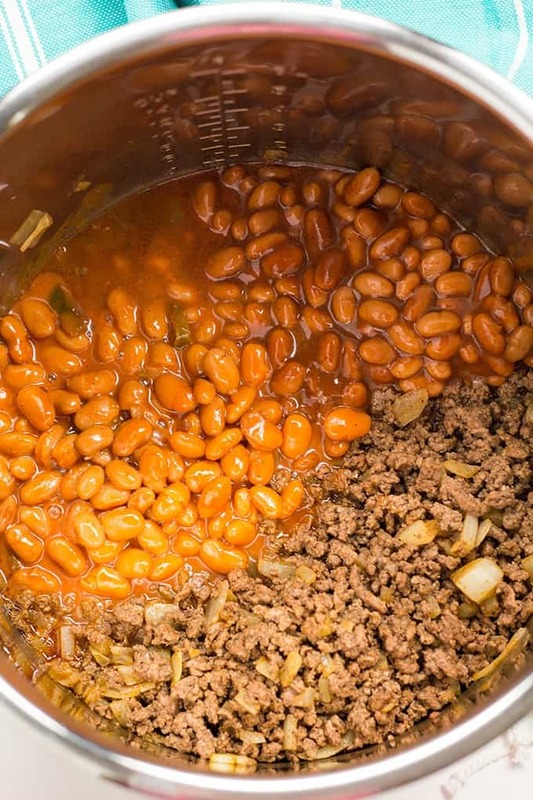 Then, you can simply add in your four cans of beans, tomato sauce, and beef broth and let the Instant Pot do all of the work! This will take about 10 minutes to come to pressure. Then, you will allow it to cook on manual for 20 minutes. After your 20 minutes is up, allow the pressure to release naturally for 10 minutes then you can do a quick release. The next step is to add a cornstarch and water “slurry” to the chili to let it thicken. 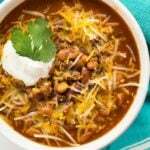 This step is optional, but it doesn’t affect the flavor at all and makes for a much thicker and hearty chili. A couple of other tips and recommendations. If you don’t have beef broth and/or like a nice strong tomato flavor in your chili, you can replace the broth with tomato juice! 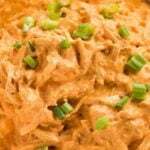 This recipe has been tested as is in a 6 quart and 8 quart instant pot. You can double the recipe in an 8 quart. Turn instant pot to saute and add the oil. Once the oil is hot, add the ground beef, onion, and seasonings and cook until meat is no longer pink. 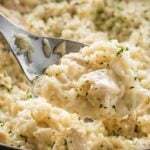 Drain any excess grease if necessary. 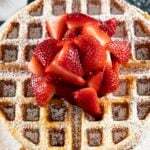 Turn the Instant Pot off and add the remaining ingredients. Stir to combine. Set the instant pot to manual, high pressure for 25 minutes. Allow the pressure to release naturally for 10 minutes, then quick release. OPTIONAL: In a small bowl mix together the cornstarch and water until smooth and immediately whisk into hot chili. 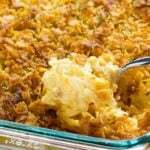 Allow to thicken for 5 minutes before serving. I’m trying to press star buttons but they aren’t working- this was 5 stars. Found your recipe a couple of months ago. Right out of the gate, it was a perfect blend of beans, meat and spices. Definite plus with the Ranch style beans,I get them at my local WM Grocery. I use 2.25lbs lean ground beef, more olive oil than recommended, mostly to really coat the pan and make sure the meat doesn’t burn. Sauté the onions in oil first then add meat, spices, etc per recipe. 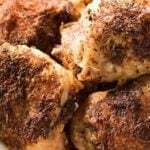 I use about 4x the recommendation of Chili powder and cumin….I love those flavors. Once drained and adding the rest, I also add three diced jalapeño with seeds removed. Stir it all up and bring to pressure. So, I modify a tiny bit, but the original recipe is still in tact and so full of flavor. I’m cooking in a 6qt IP that we won at our Christmas party in Dec 18. We use the IP at least twice per week. I used to make some mean chili, but this is my new favorite recipe. My compliments to the chef! Would I need to change anything of I doubled the beef? The flavor is on point but more beef would be fabulous! Best chili I ever made! Needed a quick dinner idea and had all of the ingredients. It does take a bit longer than 30 minutes total but well worth it! Cooked exactly per directions. It was very good. Will definitely cook it again.